The HTC One M8 flagship was announced in March and it was launched in India last month. The HTC flagship comes in three colors as of now: Gold, Grey and Silver but there seems to be more color in the pipeline. The ever reliable leakster @evleaks has posted a press shot of the Pink HTC One M8 on Twitter. The Pink HTC One M8 will supposedly released later this year alongside the Blue and Red variants. 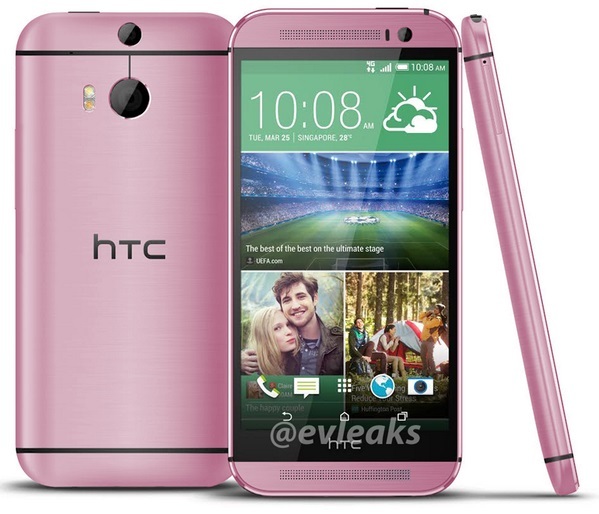 The device will be the same HTC One M8 we know, when it comes to the specs but with a Pink paint job. HTC should also release the One mini 2 (One M8 mini) later this month, so we might see these new color variants of the One M8 make an appearance there but we are not sure. The Pink One M8 should surely please the ladies and we will let you know when it is officially unveiled. Till then, you can check out our hands on images and our first impressions to know more about the One M8.